The American Major League Baseball (MLB) teams Seattle Mariners and Oakland Athletics (A’s) are here in Tokyo, Japan now to play a total of six pre-season games at the Tokyo Dome. 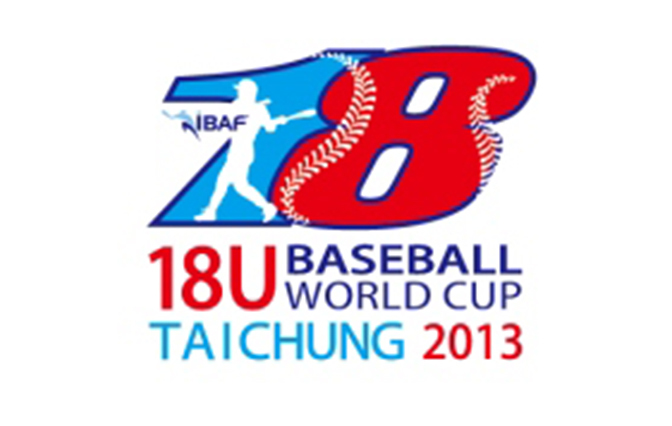 They’re scheduled to play two games against each other on 2012 March 28th and 29th. But before those games, the two American teams will play games against the Japanese baseball teams the Tokyo Giants and the (Osaka) Hanshin Tigers. Today the Seattle Mariners played the Hanshin Tigers and lost. 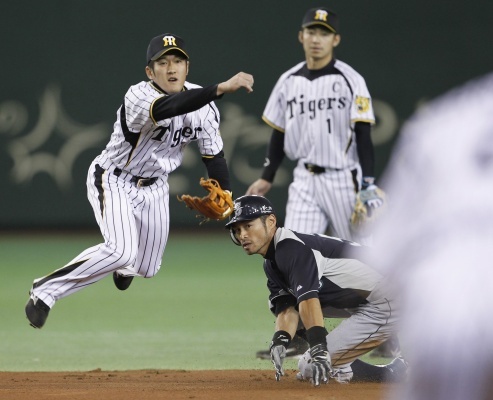 Ichiro (Suzuki) and the Seattle Mariners lost to the Hanshin Tigers in the Tokyo Dome today. And then, after that game, the Oakland A’s played the Tokyo Giants and won. This was third-generation Japanese, Ken Suzuki's (of the Oakland A's) first trip to Japan. 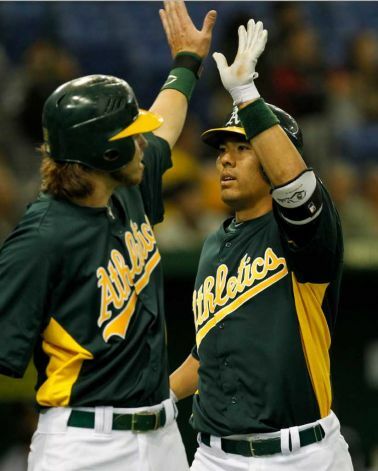 The A's beat the Tokyo Giants in today's game. Tomorrow, the two Japanese teams and the two American teams will change opponents (it will be Oakland A’s vs Hanshin Tigers and then the Seattle Mariners vs Tokyo Giants). (Images in this post are from SeattlePi.com, VancouverSun.com, and 読売新聞.co.jp). Japan has become a powerhouse in the sport of baseball. In the American MLB there are many Japan star players such as Ichiro and Hideki Matsui, the Japan team was the world champions in both the 2008 and 2009 “World Baseball Classic” games (which, unlike the so-called “Baseball World Series”, is a real international baseball championship), and tonight (4:00 AM Japan Standard Time (JST)) Japan will play in the final game of the 2010 Little League World Series. Just like the World Baseball Classic, the “Little League World Series” is an international championship match for the best baseball teams of boys up to age thirteen. The “Little League World Series” is held every August in Williamsport, Pennsylvania, USA since it was started in the late 1940s. At first, only American teams played, but in the ’60s it became an international event. The Japan team took the championship the first two years that the series became open to other countries, and has held the championship a total of six times so far (only America and China were champion more times). The Tokyo Little League won their game against Taiwan yesterday and tonight they will represent Japan in the final match of the 2010 Little League World Series against the Hawaiian team (who are representing America). After the game tonight* (it will be nighttime in Japan, but 3PM in America where they’ll be playing), either Japan or America will be the 2010 World Little League Baseball champions and the other team will be second place. A great job by both!